Kale is a yummy and healthy choice for parents but is it OK to give baby kale? Kale is a rough, leafy vegetable that has gained great momentum in the health food community, and was named a top healthy food trend in 2014 by the National Institutes of Health. Some consider kale to be a “superfood” because it is high in essential nutrients, fiber and protein but low in calories and fat. Kale comes in a variety of strains and colors, and can be dark green or even purple! Although kale looks similar to lettuce, it’s closest genetic cousin is actually a wild cabbage. Kale is a member of the Brassica oleracea family, which also includes other healthy leafy vegetables like broccoli, cauliflower and collard greens. The CDC also lists kale as an “excellent source” of Vitamins A and C. Just look at all the yummy vitamins and nutrients in one cup of fresh kale! Did you know: Kale has more calcium by weight than cows milk? Kale has 150 mg of calcium per 100 grams, while cows milk has 125 mg. Not only does kale have more calcium by weight than milk, this study conducted by in 1990 indicated that the calcium from kale was 25% more bioavailable than than the calcium from milk. So baby can get a lot of calcium for healthy bones and teeth just by eating kale! According to the EWG, although, “leafy greens-kale and collard greens”….do not meet traditional Dirty Dozen ranking criteria [they] were frequently found to be contaminated with insecticides toxic to the human nervous system”. Because of this we recommend buying only organic kale for making baby food, if possible. Choosing Kale for Baby: Kale comes in two main varieties- kale with flat, smooth leaves like dino kale (also called lacianto) or curled, crinkly leaves like curly kale. Lacianto kale is notably sweeter than curly or purple kale. Other popular varieties include: red russian kale and redbor kale. When choosing kale for baby, choose kale with firm, deeply colored leaves and moist stems. Do not buy kale if it is yellowed, browned, has holes or appears too soft/dry to the touch. If possible, choose “baby kale” which is more tender and has a sweeter taste than bigger kale leaves. You can keep kale for baby in the refrigerator up to 5 days- but do consume kale as quickly as possible due to the increasing bitterness that occurs from storage. Avoid washing kale before use, as moisture shortens the lifespan of kale. When Can Baby Have Kale? Currently there are mixed opinions on when it is okay to give baby kale. Some people say baby can eat kale when they are 6-8 months old. The FDA warns nitrates in kale and other dark, leafy green vegetables can make baby sick before he is 7 months old, Because we are conservative at wholesomebabyfood, we recommend exercising similar caution to spinach and waiting until baby is at least 6-8 months old to try kale. Commercial baby food companies like Beechnut and Plum Organics, also offer “kale baby foods” in their Stage 2 line of baby foods for babies “around 6 months old”. But Doesn’t Kale Have Oxalates? Oxalates are a naturally-occurring substance found in plants, humans and animals. Although kale does have trace amount of oxalates like spinach, kale has only 2 mg of oxalate per 1 cup vs. 656 mg of oxalate in 1 cup of spinach (Harvard Public School of Health). Learn more about oxalates in baby food here. This recipe is a great “starter” recipe for making your own baby food from kale. Don’t forget that you can also use fresh/frozen kale puree and add it to baby’s food for extra nutrients and vitamins! Step 1: Wash kale thoroughly and discard the stems. Step 2: Cook the kale. You can cook in boiling water for 5 minutes OR microwave on HIGH for 7 minutes, stirring halfway through. If boiling, reserve about 1/2 cup of the liquid to blend or puree baby’s food in your food processor or blender (your magic bullet works, too). Note: If using the microwave, leave the water droplets left from washing to help with the steaming process. There’s no need to add extra water if microwaving! Step 3: Let your fresh kale puree sit and cool. Serve to baby or pour in to ice cube trays and save using the ice cube method. This smoothie is a yummy way to give baby a fresh green smoothie! 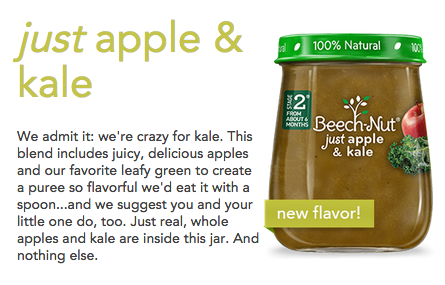 The sweetness of apple is perfect for hiding the bitter taste of kale. Best of all Mom and Dad can have some smoothie too! Blend all the ingredients together in your food processor or blender. Blend until all ingredients are mixed together- yum!